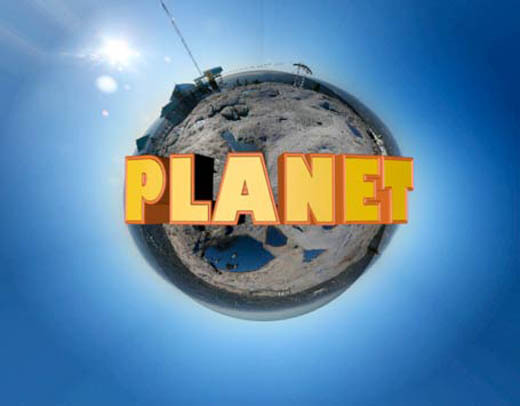 Learn how to take a panoramic image and create a globe with 3D text in Cinema 4D and Photoshop. To start with I will be using a panoramic image I created by using Photoshop’s Photomerge feature that stitched together 25 individual photos into one large panoramic photo. 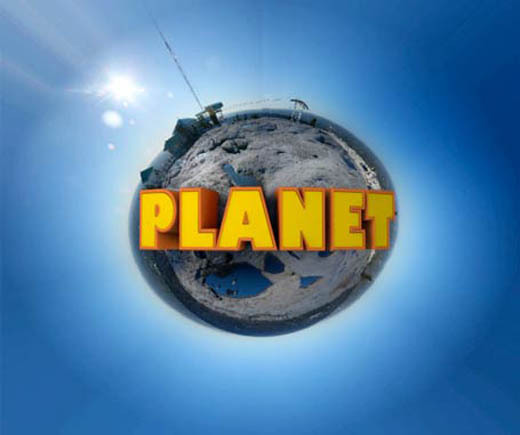 You can use the same panoramic image I’m using by downloading it here, or you can use one you created yourself. Step 1: To start go to Edit / Transform / and Flip Vertical. Now the sky is on the bottom and the ground is on the top. 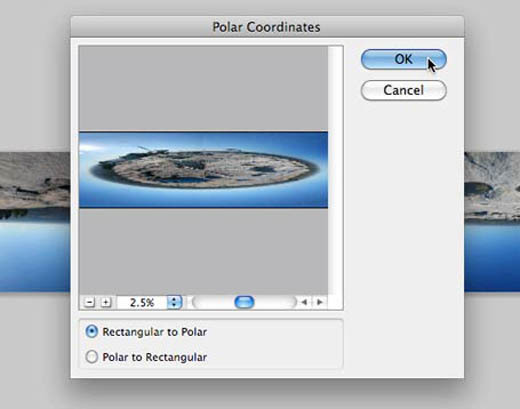 Then go to Filters -> Distort -> Polar Coordinates and choose Rectangular to Polar. 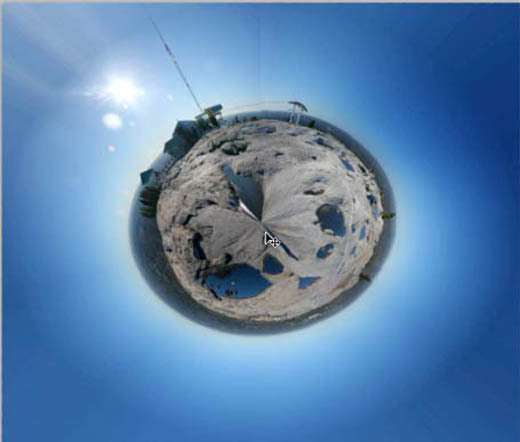 This will take the panoramic image and turn it into a sphere. Step 2: Now you need to correct the distortion caused by the Polar Coordinate Filter. 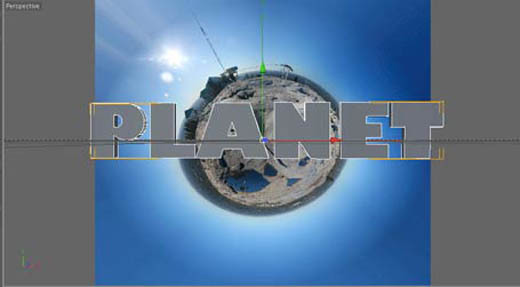 Select Edit -> Free Transform (or Command + T) and drag the image to the right till the globe looks like the correct shape. Step 3: Now use the Crop tool to remove the extra pixels to the left, then save your image out as a JPG. 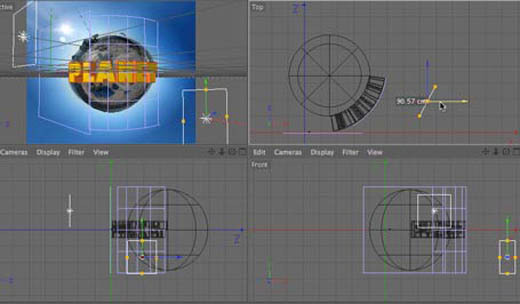 Step 4: Launch Cinema 4D and create a new Background object by going toObjects –> Scene –> Background. Step 5: Next create a new material and import the image you created in Photoshop into the Color option of the new material. Now drag and drop this material on the Background object your created. You may notice that the picture is a little stretched, this is because theBackground object’s size and the final output render size are not the same aspect ratio. 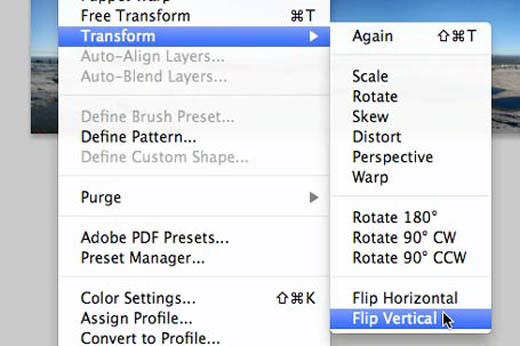 To fix this go to the render settings and change the width and height to fit the size of the image you created in Photoshop. Step 6: Now select the Text tool and create the words you want to go across the globe. When you’re done create an Extrude NURBS object and drag the text into it to create the 3D text. Adjust the extrude distance if you want your text to look thicker. Make sure to position your camera directly in front of you object. You can see in the image below that plane is lined up with the center of the globe. Step 8: In the text caps object make sure that under the Caps tab it’s set to only caps. 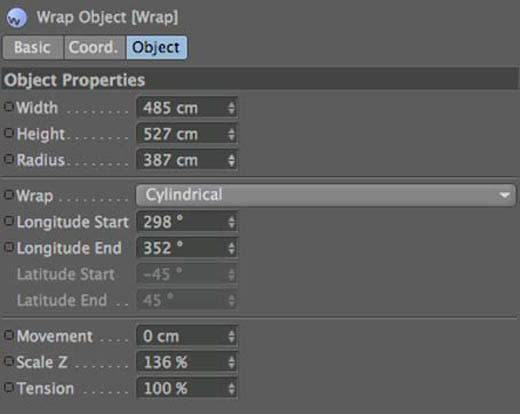 For the text fillet object make sure it’s set to “Fillet” and changed the Steps to 5 and the Radius to 10cm. 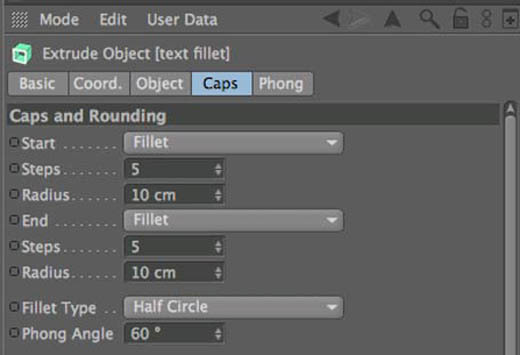 Change the Fillet Type to Half Circle. 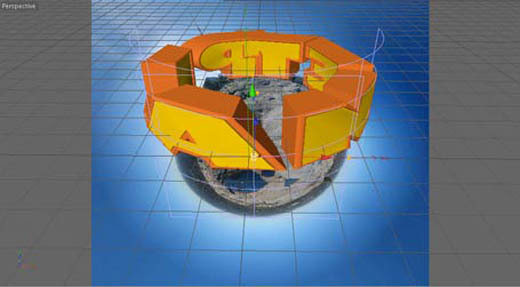 Now create two different colored materials and apply one to the “text caps” object and the other to the “text fillet” object. You should get an image like one below. Step 9: Group the two text objects together in a group and call the group “text group.” Then create a “Wrap” effector and drag it into the text group. 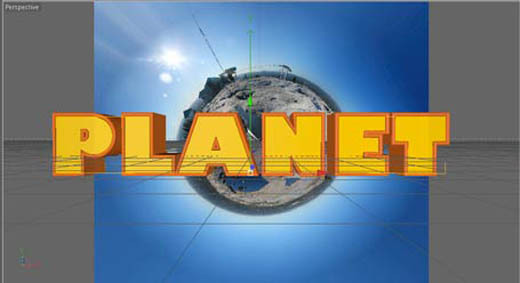 You’ll see it will start to warp the text into a sphere shape. Step 10: Now adjust the settings of the Wrap to fit the globe in the background image, you can use the settings I used to help you out. 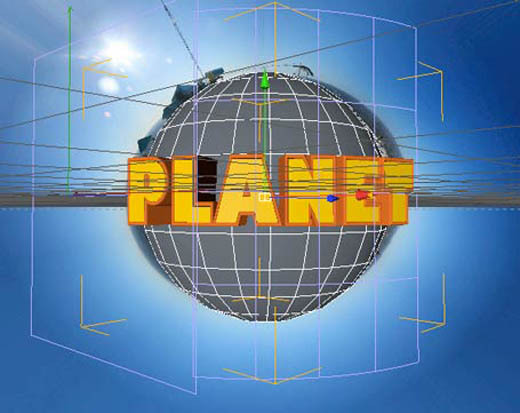 Step 11: Now create a polygon sphere object and move it behind the text. 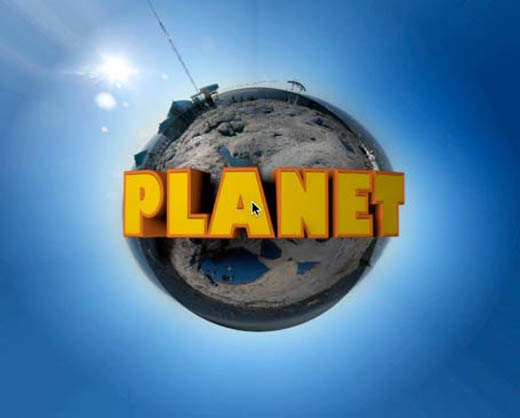 Scale it up to fit perfectly with the planet in the background. 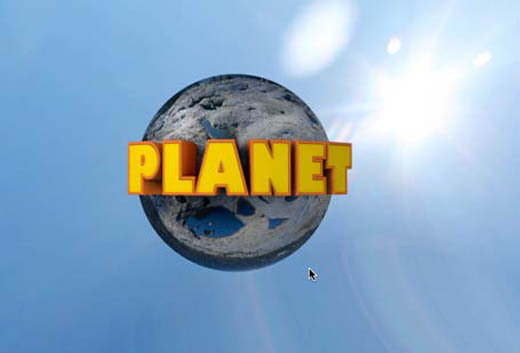 We’re going to use this to capture the shadows from the text, making it look like the text is actually part of the planet and not just floating in the air. Step 12: Now drag and drop the same texture you created for thebackground onto the sphere object. 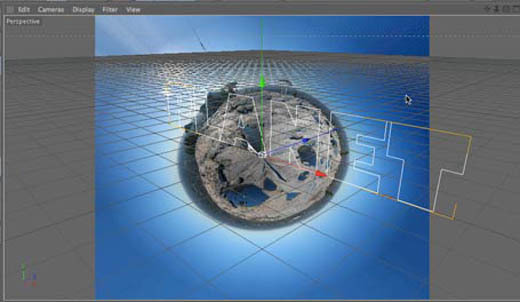 Click on the texture icon to load the texture settings and change the Projection to Frontal. Now are texture is perfectly projected on the sphere, when you render there shouldn’t be a noticeable difference in the image. Step 13: Create a light and change the Type to Area and turn on Soft Shadow Maps. Position it off to the upper left side of the globe, this will be our keylight. 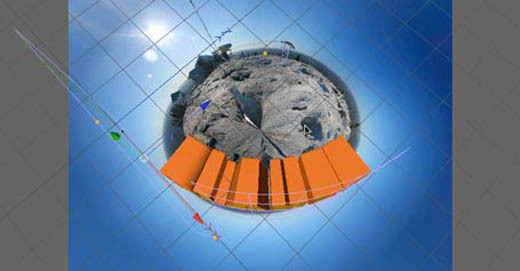 Create a second light and position it to the lower right of the globe, this will be our fill light. Turn the intensity down to 90% and change the color to a light blue. Step 14: Go to Objects -> Scene -> and add a Sky object. 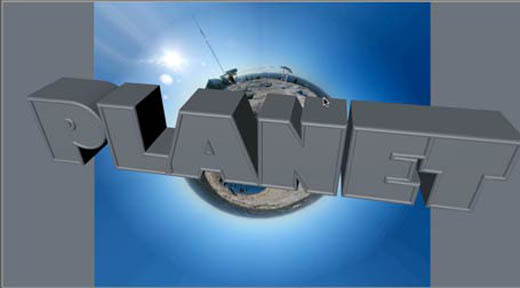 Drag the same globe texture used for the background object and sphere onto the new sky object. 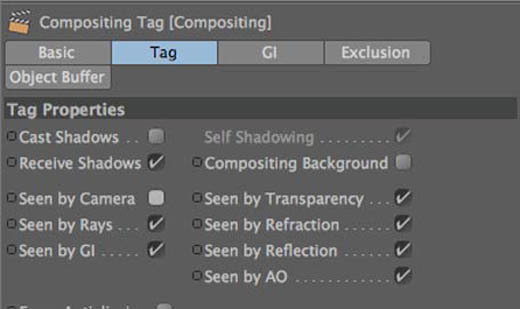 Step 15: With the Sky object selected create a Compositing Tag and turn offSeen by Camera. 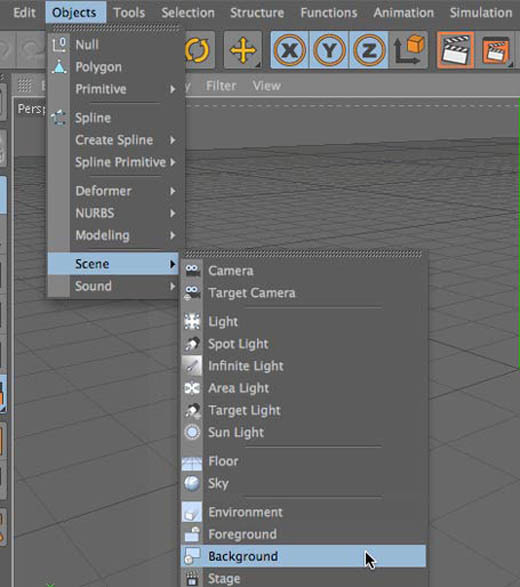 Now when you render your scene the Sky object will still effect the lighting but it will not show up when you render your scene. Now turn on the Ambient Occlusion and Global Illumination options in your render settings. 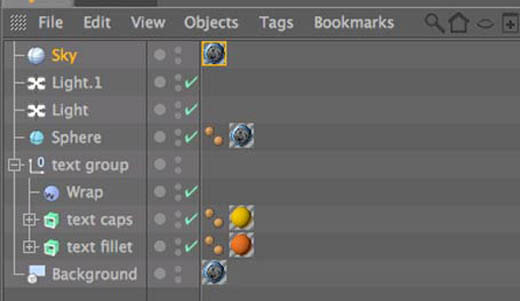 Hit render and you’ll see a noticeable difference in your final image with these two features turned on.